Best description of what I saw? It was like an extravagant silent film! The extreme facial expressions and mannerism used to express the flamboyant characters by the actors themselves could be compared to that of miming. Now hear me out, it seems crazy to compare the opera to a form of acting performed without sound, but it truly did seem like it. This idea stemmed from the fact that, this story was not told through words and dialogue (or in this case translated Italian) but from the magnified way in which the actors co-operatively played their parts in this epic and comedic tale. It was a picture painted beautifully, and clearly too! Even a simple teenager like myself, who just about scraped through GCSE Italian, could grasp the emotions and plot-line with no trouble. For this, I must say “molto grazie”. Considering I was this astounded by just the facial expressions alone, you can only guess how I reacted when the actors opened their mouths. Undoubtedly, I had some idea of what to expect. It’s the opera. There is going to be astounding singing. But what I’m trying to say is… I had absolutely no idea what I was about to witness. There is no way I was prepared for that level of skill, that volume, that range, that vocal vibration! I was blown away. Can you tell this is my first opera yet?! 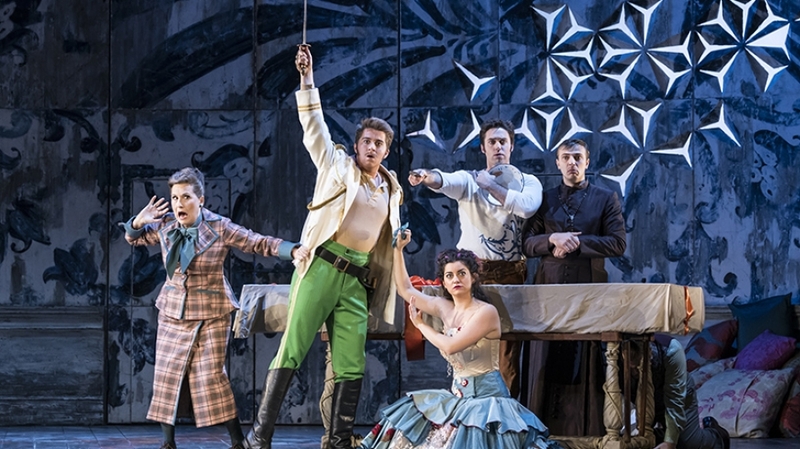 The amount of intricacy within set, costume, scene movement, comedic elements and character work is a level of grandeur I have only yet to witness within the world of opera (which I have now had the pleasure of being exposed to). It all just came together in this overwhelming assembly of vibrant colours transporting me to the bustling city of Seville. Not to mention, the music commanded this show with a passion and vigour actors could only dream of portraying. Characters only seemed to move if the stanza command it. Moods and atmospheres could change with a single key note change; another reason as to why it really did seem like an extraordinary silent film. Each character belonged on that stage holding an equal purpose which, for me as an actor myself, found most enjoyable. Whether you were the main protagonist or a silent servant to Doctor Bartolo, everyone had perfect comedic timing and reactions to the surroundings that you just could not ignore. In fact, there was so much going on around the stage that, most of the time, I just didn’t know where to look! I won’t lie to you, there were tears of laughter from me and a rather embarrassing snort at one point (which did turn some heads to my complete horror). In conclusion to this rather enthusiastic spill of emotions from myself, I suppose the overbearing message is: PLEASE WATCH THIS! Whether it’s your first time watching an opera or you’ve seen this show before, it is most certainly worth it. The modernised, playful and theatrically brilliant re-design of what can be considered an old 18th century play is, without question, one of the most entertaining things I’ve witnessed in the year and, as we’re coming almost to the end of this year, says a lot.